LiveCode LessonsGetting Started with LiveCodeGet Up and Running with LiveCode iOS PrerequisitesHow do I build an iOS application? 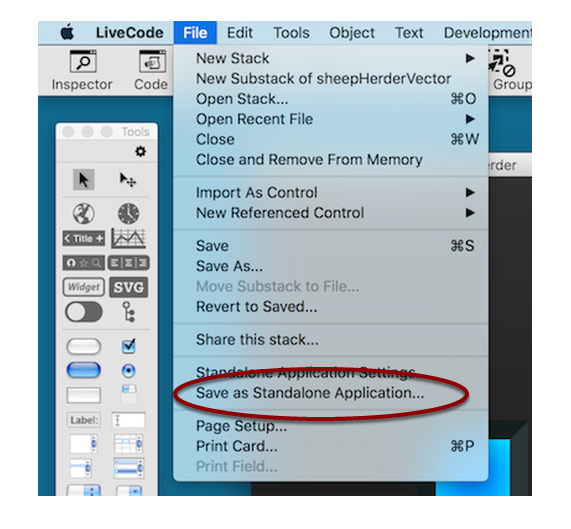 This lesson will show you how to use LiveCode to create, test and deploy an iPhone or iPad application. 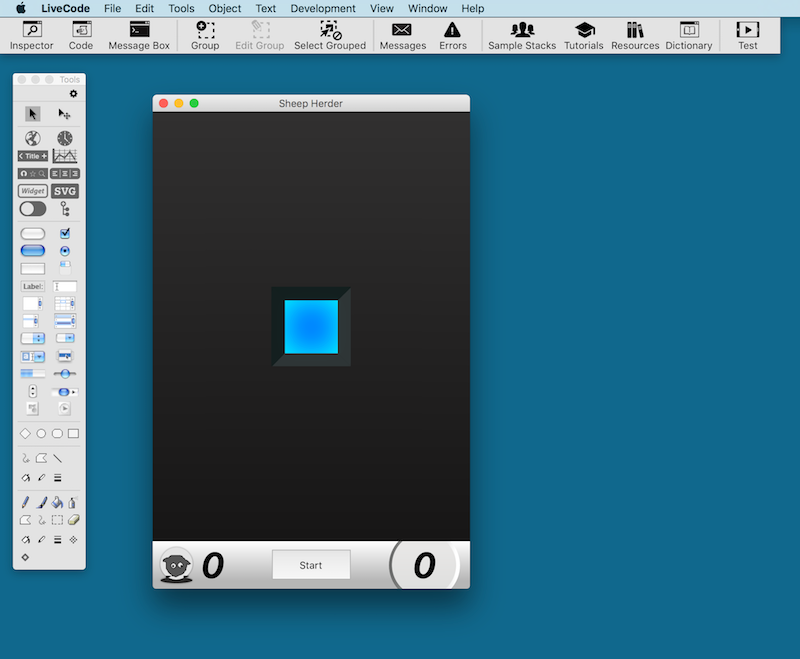 Before you can build iOS applications, you'll need to have Xcode installed on your machine. This is currently available from the Mac App Store or you can register as an iPhone developer and get older SDKs here: http://developer.apple.com/iphone. For more information on how to get started with iPhone development see this lesson: How Do I Become An iOS Developer. If you are creating an App from scratch, you can choose one of the premade stack sizes in the File Menu to suit your iPhone or iPad screen. 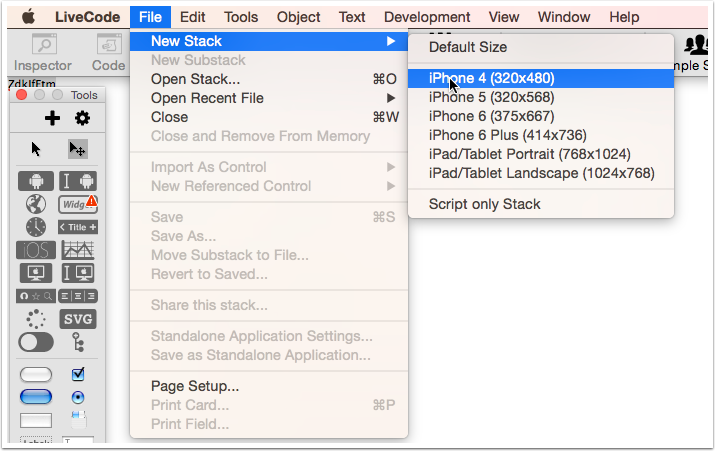 You can also easily resize your stack to fit whatever device you are creating your project for. Open the standalone application setting from the File menu and go to the iOS tab. Here you'll be able to configure the Apps basic settings and also set a wide range of other more fine grained options (Plist options for those more seasoned developers). 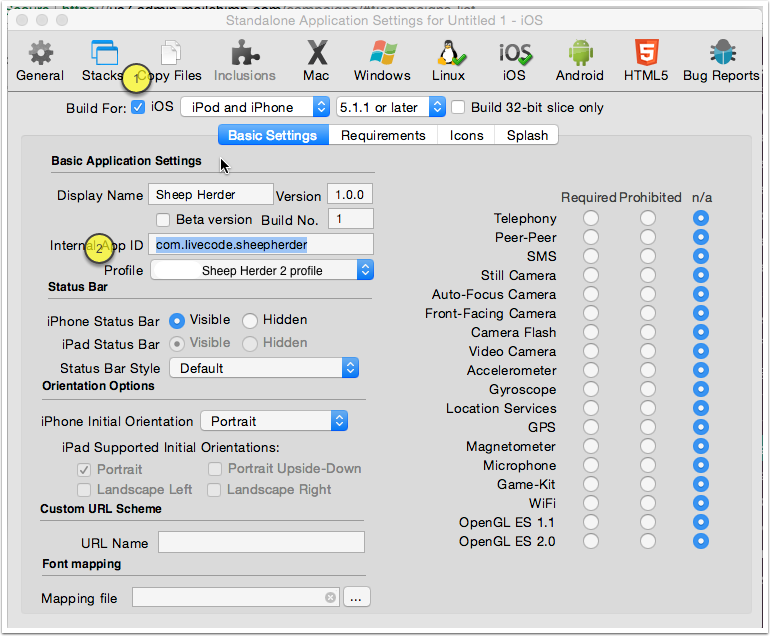 You must select "Build for iOS" (1) in order to enable the Simulator and building iOS standalones. You must also select the device profile(2) you created when you registered with Apple. (if deploying to a test device). Your standalone settings may look like the first screenshot in older versions, or the second if you are using a recent version of LiveCode. When you install the Xcode on your machine, you'll get an iOS simulator application, which allows you to debug your iOS apps more easily than using a real device. Once you have selected the build for iOS option in the standalone builder and selected a simulator from the development menu,you'll see the "Test" button has now become active. Clicking this will launch the simulator*. NB Xcode must be linked to your version of LiveCode via LiveCodes Mobile Support Preferences. This option is available from "LiveCode"--->"Preferences"---->"Mobile Support"
Once you have registered appropriately as an iPhone developer and setup your certificate and obtained a provisioning profile, you can deploy your application onto a real iPhone, iPad or iPod touch. To do this, simply choose your provisioning profile from the drop-down list in the standalone application setting screen(like discussed above), and then select "Save as Standalone Application..." from the file menu. Note: Your Internal App ID, set in the standalone builder, is what iOS uses to identify the app. If there is an app on the device with the same identifier as the app you are adding it will assume it is an update and overwrite the app on the device. To avoid this you need to make this ID different for each of your apps. For more information on registering as an iPhone developer see the lesson here: How Do I Become An iOS Developer. Note: if you receive a "linking for armv7 failed with g++: failed to exec /Applications/Xcode.app/Contents/Developer/usr/bin/clang++; No such file or directory" error message when building this generally means the required command line tools have not been automatically set in Xcode. You can resolve this by opening Xcodes preferences, navigating to "Locations" and select the available command line tools from the drop down menu. If none are present, you may need to download them from the "Downloads" tab. 2) In the 'Window' menu select 3) "Devices"
Your app should now be on your device! I am an old-style-dbase-III-style developer and I am testing the free trial live code. I love it. I would like to know if when I finish my project and build the stand-alone-app (and buy the apple developer license and live code license), will I have to learn x-code and modify the app in order to send the app to apple so it can be approved and sold in the app store? No - no xcode and no conversion necessary to get the app into the app store. once you have implemented your application and it works on the iOS simulator, you should be able to submit it to the app store. As you point out correctly, you will first have to follow the appropriate certification and approval process. You should not have to write any x-code. You can check out the following lessons for more information: "How do I Create a Distribution Profile for iOS? ", "How do I set up an App for Submission to iTunes Connect?" and "How do I Submit an iOS App to the App Store?". I can't seem to install more than one application on my phone. How do I go about adding more applications that I have created in LiveCode to my phone through xCode? Whenever I try to add a new app, it forces me to overwrite the one I already have on there. In the iOS Standalone Application Settings you can set the Internal App ID, by default this is com.yourcompany.yourapp. This is what iOS uses to identify the app, if there is an app on the device with the same identifier as the app you are adding it will assume it is an update and overwrite the app on the device. You just need to make this ID different for each of your apps. Do I have to join the iOS Developer program (as a paid member) to even get my LiveCode app to run in the iOS Simulator? There is a free Apple Developer Program you can join which allows you to run your apps in the simulator but not deploy them to a real device or put them in the App Store. For this you do need to join the paid for program. Thank you for LiveCode, I really like it. At the moment I try to submit my App for the App store. But first I try to save it as a stand alone, and there the problem starts. I have to check the Application Profile, but there is only I can select. In your example I see under "Open the standalone builder and configure deployment options" you check 'RevMobile iPhone PreAlpha'. In other words, how can I set the profile proper? I am assuming you are trying to select "RevMobile iPhone PreAlpha" from the "Profile" drop down menu. "RevMobile iPhone PreAlpha" is a provisioning profile we set up to test the application. You have to set up a provisioning profile for application distribution. Once you have done that, you should have a provisioning profile for App Store distribution. I try to create a distribution profile now. It takes a lot of time. The lessons are very helpful, Hanson, I suppose I have to make an App ID, too? yes should create an App ID early on. You can find more information on the App ID from the Apple iOS Developer Portal. Yes, there are a number of steps involved in getting your App into the App Store. We do not control the submission process and can only point you at the steps you have to take. I'm trying to run an iOS app but when I press the 'test' button to run the simulator I get a message saying 'Unable to start simulation: iOS simulator failed to install the application'. I appear to have the correct SDKs installed (I get the little green box in the 'preferences/mobile support' window). In 'standalone application settings' I have 'iOS' selected and though I have a number of different profiles I have selected each of them in turn but none seems to work. Any clues as to what might be going wrong? When I am at the Standalone App Settings window there is (none) on the Profile setting. I have followed all the directions to set up my developer profile and have obtained the public and private developer keys as well as two provisioning profiles and the iPhone Developer Certificate. Livecode and the apple developer stuff should be paid for. I have tested my application in the iphone simulator and it does work correctly. I have a Mac OS 10.7.4, Livecode 5.5.4, and Xcode versions 4.4 and 4.6.1.
you could get that error message if you already have a stack with the same name installed on the simulator. If that is the cause for the problem, then you can either remove the stack from the simulator, change the "Internal App ID" in the Standalone Application Settings, or you can use the reset function in your iOS simulator. it sounds like LiveCode cannot see your Provisioning Profile. It is possible that even though you have one, it may not be installed. Open Xcode to launch the Organizer "Window->Organizer". A new window opens. Select the "Devices" icon a the top of the window. On the left hand side select "Provisioning Profiles" to display what profiles are installed. If the relevant profile is missing, then select the "Import" button at the bottom of the window and import the profile you are missing. I have a Mac OS 10.7.4, Livecode 5.5.4, and Xcode versions 4.4 and 4.6.1. Is is possible to build for iphone 5 only? "Open the standalone builder and go to the iOS tab. Here you'll be able to configure the Apps basic settings and also set a wide range of other more fine grained options (Plist options for those more seasoned developers). You must also select the device profile(2) you created when you registered with Apple." However, there is no iOS tab in the application settings for the new project I just created. I can see a Test Target item in the Development Pull Down Menu, but the choices there are grayed out. I am already a registered Apple iOS developer and have valid certificates. What am I missing? You can open the Standalone Application Setting from the File menu. In there you can check the option for building for iOS. This should enable the Test option for testing on the simulator. it is not specifically possible to build for iPhone 5, but you can limit your application to a minimum iOS version. If you would like your application to work only on iPhone 5, then you could use the iPhoneDeviceResolution function to get the resolution of the device and determine if you would like your application to run on this device. If this function does not return the resolution your application requires, then you could launch a dialog that requests the user to terminate the application. How about the SDK load? I started with a new install of xCode about two months ago and only have the iOS 6 libraries. When I try to build an app I get an error message that I'm missing the files for iOS 5 or that the version of arm processor I'm building for is wrong. Any suggestions? This shows you how to include a number of version of xCode in LiveCode. In that example we use xCode 4.4 and 4.5. This supports 5.1 and 6.0. I would try including something like xCode 4.3.1. This should give you support for 5.0. I have tried to create a simple hello world application for iOS. I have a provisioning profile setup but when I try to install the app on my iPad using iTunes, it fails to install. if you want to install an application on your iPad, then you need to subscribe to the iOS Developer Program, I assume you did that, as you have a provisioning profile. At the end of that lesson there is a further link to a lesson that gives you more information on developing for iOS. Thank you Hanson. one reason I've experience that problem is that, I think I used the same provisioning profile which is already used by other app? I've used another valid profile which was setup by my colleague before and it works fine. Another thing is, I've tried to create another development provisioning profile but I got "Valid signing identity not found" on the status when I install it. 1. Create another app ID under identifier and select 1 current certificate. 3. Download both the certificate and provisioning profile and install them, got not valid signing identity problem. great, thank you for sharing your experience and solution. The iOS provisioning process can be challenging and may require more than one attempt to get right. We provide information in our lessons on provisioning, but this is targeted more at provisioning with regards to the requirements for LiveCode. Apple provide detailed step by step instructions on provisioning for iOS development in their developers portal. I have tried to download the sheep application in order to work with this tutorial, but it is only zero bytes, ergo: there is nothing to download. I went to the page you guys mention hereabove, and click on the download link. Then I a asked to save the file somewhere (like always when I download something) but when I download it, it is an empty file. I tried to rename it but it didn't help either. Any suggestions? Maybe the download link is 'dead' ? I refer to your last step of dragging the apps bundle onto the device. However the apps is all greyed out when I tried to add it not the application area. The apps was working fine in the iOS simulator and the provisioning profile has been set up correctly. What do you think is the problem and how can I resolve it? Thanks. Depending on the version of xCode you are using, it is possible that the layout of the organizer window has changed. More recent versions of xCode have the app window on the top right. You may also find that there is a green circle with a white "+" in it, next to the application name when you drag it onto the correct field. 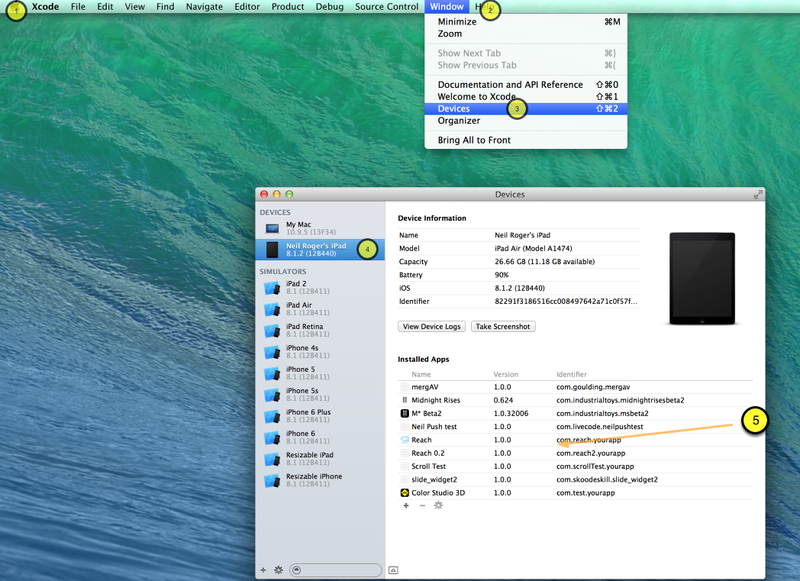 Also note that the extension of the file you want to drag is ".app"
Hope this addresses the issue for you. Yes, I have mistaken the source code for the apps bundle. During the generation of the apps bundle, there is an error message when the checkboxes in the "Requirements and Restrictions" section are checked. Not sure why. Anyway, I was finally able to deployed the apps on my iPhone successfully. When I do the last step in the instructions, I get an error that says "The executable was signed with invalid entitlements." How can I tell what is amiss and what do I have to fix? Glad you got it sorted, I'm sure others will run into the same issue so thanks for posting the solution here.